I was explaining a Christian’s position regarding multiple holidays throughout the year last night to a couple of new believers. “The church, generally speaking, likes to celebrate,” I said. The two biggest holidays, Christmas and Easter, center around the birth and redemptive death and resurrection of Jesus. Valentine’s Day? Why sure! Mothers and Fathers Day, no problem with that! Your respective country’s Independence Day. Bring out the fire crackers! But in Mexico, Halloween and Day of the Dead? Well….no. Which of course creates a bit of confusion on social networks, when believers here see their friends dressing up and clearly celebrating Halloween. It has caused a fair amount of friction even with our own kids. How come?…and we know what question follows. How come all my friends in the States (or most of them) dress up and ask for candy, and I’m not allowed to do so? Well…as far as the candy, we usually end up giving candy to the waves of kids who knock on our door. But celebrating Halloween and its Mexican counterpart Day of the Dead…it’s just too dark. I’m not going to go into that here, but I certainly have in the past. If you’re interested, click some of these links: Pátzcuaro, Mixqui, and Spiritual Darkness, Is Mexico a Christian Country? Part 6, A Long Weekend…for Day of the Dead, Day of the Dead Outreach. 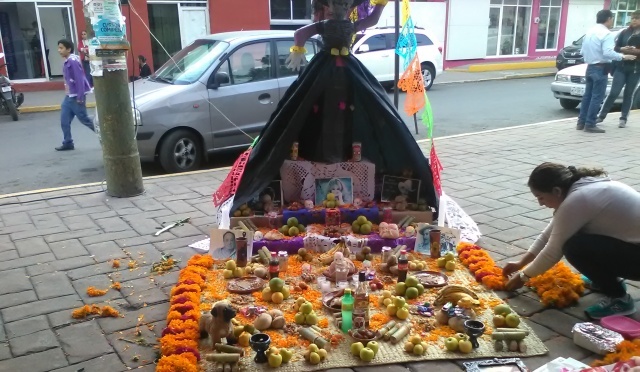 Many Mexicans worship the Holy Death image, the Grim Reaper figure, and they worship Death as if she were a person, an angel/demon. I could go into a lot of detail, but the whole thing makes me nauseous. 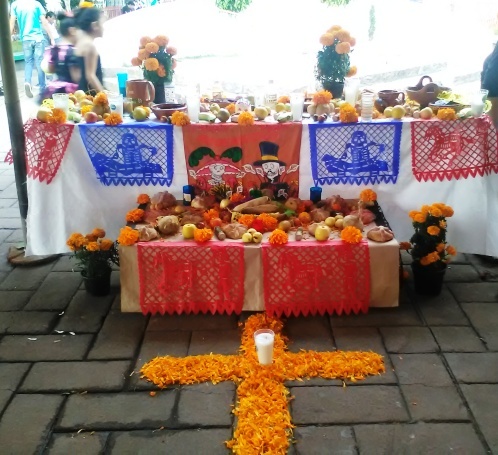 But many, many more Mexicans will put a table with an offering of fruit, food and often tequila for the spirits of their departed family members. The belief is that their spirits will come back during these days of the dead, and enjoy foods they once liked while alive. People who died as adults come back November 1. Child spirits return November 2. 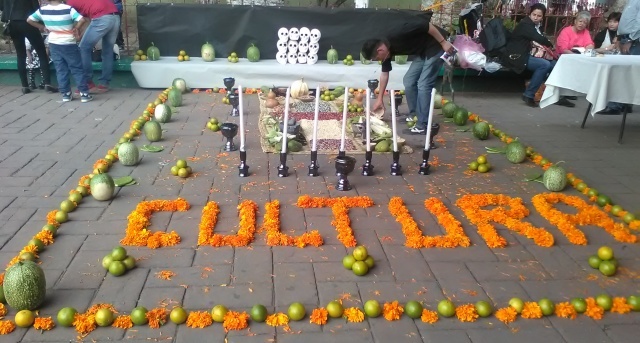 I was enrolling David in a drum class downtown Ixtapaluca this afternoon and ran into a Day of the Dead display in front of the municipal auditorium. 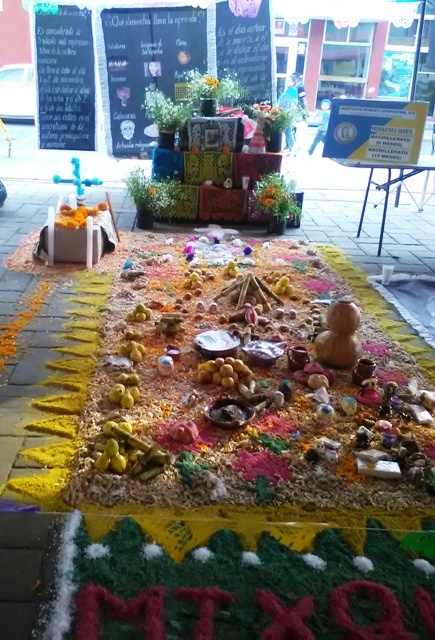 Here are some pictures of some of those offerings, or ofrendas. The two little girls in the header picture were also there, and their mother gave me permission to take their picture.